Kameel Hawa will present his typographic sculptures and reveal the creative process and the conceptual considerations behind these projects. 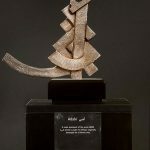 He will highlight the artistic power and poetry of the Arabic letterforms, and their cultural contribution to public space. Lebanese designer, painter, and writer Kameel Hawa’s name has become synonymous with Almohtaraf, the design house that he founded more than 3 decades ago. Born in 1947 and a graduate of the American University of Beirut, Kameel approached graphic design as a mission. The originality of the work AlMohtaraf has created throughout the years lies in their blend of art and design, tradition and modernity— a meaningful message communicated in an indigenous yet contemporary form. 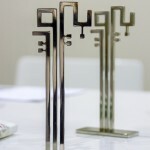 AlMohtaraf, the only pan-Arab design house, has left an impact on the design scene in the region. 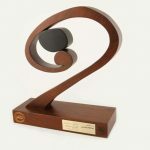 Kameel Hawa himself is gaining acclaim for his type design, his unique creations in word art, and for his typographic sculpture. His first project was an interpretation of the name Beirut in Arabic which stands prominently in the city’s downtown. 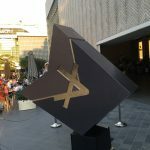 In 2014, his public installation of 8 sculptural interpretations of the word Fann, (Arabic for Art) over Samir Kassir pool won him widespread recognition. 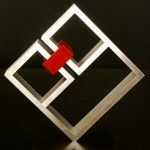 Recently he unveiled another typographic sculpture representing the acronym of his Alma matter AUB. 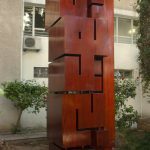 His latest design project presented in last year’s Beirut Art Week, is a typographic sculptural interpretation of the complete Phoenician Alphabet represented by the first letter Aleph.